This is for all the friends who are sad and/or sick in recent weeks. Hope this and tomorrow's will bring a little smile to brighten your day a little bit. While I don't hope to be able to solve your problem and/or cure your illness, every little grin counts, I supposed. naeboo: Ah.... welcome! Welcome! First time here hor? Where got mean? I neber make fun of dead people wor? Next time ask them to burn normal stuff like paper MacBook Pro, paper en-bloc Condo, paper Star Cruise Virgo, paper Petronas Tower like the rest of us lor. 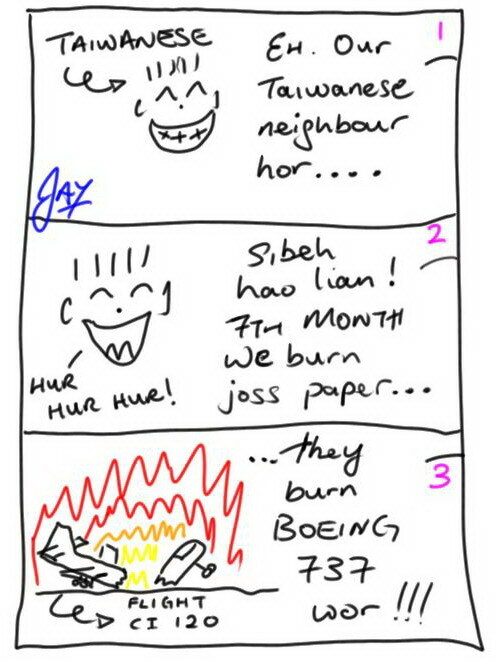 Don't so hao lian burn real aeroplane, then I dun disturb lor. Acherly hor, I shudder to think of the day Ch1na Airlines take delivery of the new Airbus 380. I haven't learn how to draw that yet. I better start practicing now.